Our beautiful condo is located on the 4th floor of Building 'C' with lovely views of both the ocean and the mountains from the lanai, at the Kihei Akahi Resort in beautiful South Kihei, Maui, Hawaii. Our condo has been completely upgraded and very well maintained. It is tastefully decorated with Polynesian furniture throughout. Everything one would need to enjoy a pleasant vacation in paradise is here at your finger tips. Besides renting our condo on VRBO, we live here on Maui which enables us to make sure the condo is always in top notch condition. There is air conditioning plus 2 ceiling fans, one in the living room and one in the bedroom. For those that prefer the tropical breeze over a/c there is a security screen door that can be left open to allow the afternoon breezes to flow through your condo. Ceramic floor tile and Berber carpet are used throughout the condo. Including in the furnishings are a DVD library and various books. There are also board games and cards for your use. If you are in need of reading materials. For those that just could not escape without your laptop, there is an all-in-one printer, copier, scanner for your use along with free designated high speed internet access. There is also free long distance calls; Inter-island, Mainland and Canada. The kitchen has oak cabinets, an island and beautiful granite countertops. The refrigerator has an in-door water and ice dispenser. The microwave is built-in above the range. The kitchen is open to the dining room as well as the living room, no wall blocking your view, allowing for conversation between the chef and others. All small appliances are just a a year young. Everything you could every need is there for your use while either preparing a meal inside or opting to use one of the poolside bbqs. The bathroom has a full size prefabricated marble shower. It is stocked with lush towels which are replenished at least three times a year. No need to pack your hairdryer as there is one here. Enjoy relaxing on your lanai sipping your morning cup of coffee, tea or juice while listening to the island birds greet the sun as it begins to rise over Haleakala. In the evening, the lanai is a pleasant spot to view the sunset if you prefer not to walk across the street to the beach. Whale watching is simply fantastic during whale season. When you are ready to venture out to one of the many wonderful beaches or even a drive around the island there are Boogie Boards, beach chairs, beach towels, beach mats, sun umbrellas and even a cooler for your use. Kihei Akahi has 2 Swimming Pools, Pool Side Barbecues, Tennis Court, Private Parking, Front Desk, Activity Center and 24 hour Security. The Resort is located across the street from Kamaole Park Beach II and is less than one block from the Kamaole Shopping Mall. We feel that the location is simply perfect, Enjoy! Kamaole Park Beach II is noted for sensational Swimming, Snorkeling, Boogie-Boarding and Whale Watching. The Sunsets can be very spectacular. We rank this as one of Maui's finest beaches. Kihei is on the sunny side of the island. Kihei has great beaches, fine dinning, great shopping, farmers markets and much more all within walking distance. COME ALONG AND ENJOY THIS BEAUTIFUL PIECE OF PARADISE!! We also own another lovely 1 bedroom unit located in the same building, same floor, just seven doors away, in case you are traveling with another couple looking for their own accommodations. Please go to the link which is located below to view the pictures. Please contact us for details and availabilty. My husband and I currently live on Maui. Our condos are our home away from home and we have made many updates to make them both comfortable for all of our guests. We recently purchased another condo which is also in Building 'C' on the same floor, 4th. The main differences are; the newest condo does have a shower plus tub. This condo has been recently updated with all new kitchen items; small appliances such as toaster, blender, coffee maker, knife block, dishes, pots and pans, cooking utensils, stemware, silver ware, bath linens, king bed and all new lines, lamps, air conditioning. We also purchased new lawn chairs, beach towels, mats, cooler. I am sure that either condo will make your visit to Maui comfortable and enjoyable. Thank you to all who have made the choice to return to both of our condos year after year! Much went into our decision to purchase our condo here in Kihei. 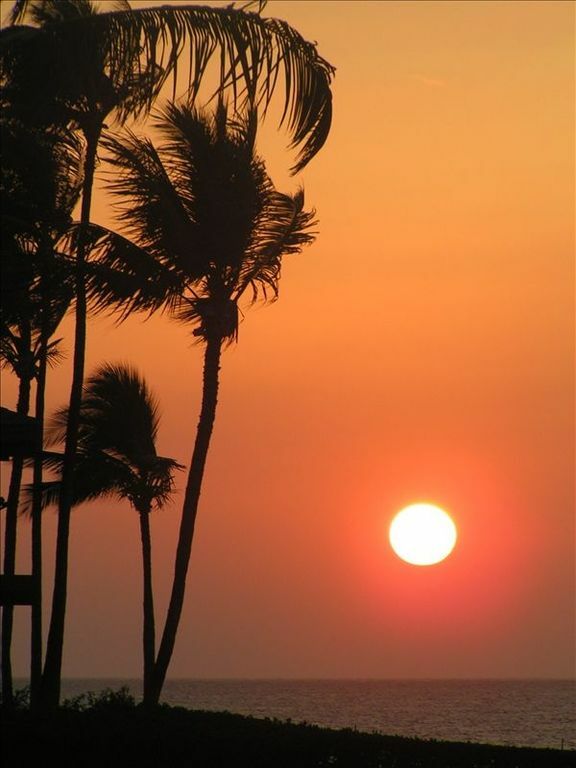 We feel that Kihei is a great location as it is on the leeward side of Haleakhala, therefore, offering some of the sunniest weather on the island. The afternoon tradewinds are delightful. We are fortunate to be located across the street from one of the best beaches on Maui and just a short distance from many other wonderful beaches. We are only about a mile from Wailea and all of it's wonderful shops and fine restaurants. Many of our guests tell us the reason they return each year is because we continue to keep our condo updated. Everything you could ever need is there at your finger tips. Waking each morning to the sound of the birds, enjoying breakfast on the lanai, watching the sunrise over Haleakala and the whales frolicking in the ocean before heading out for wonderful morning walks along the beach...what better way to start each day.